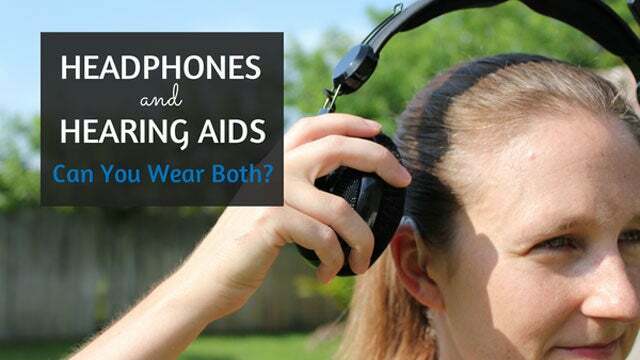 I hate that there is a stigma around wearing hearing aids. Mainly because I’ve seen first hand how significantly someone’s life can improve with the use of hearing aids. But I also dislike the stigma because it’s completely irrational if you think about it. People wear shoes, glasses, gloves, contacts, wigs, and so forth. These are all technological upgrades that improve people’s lives. 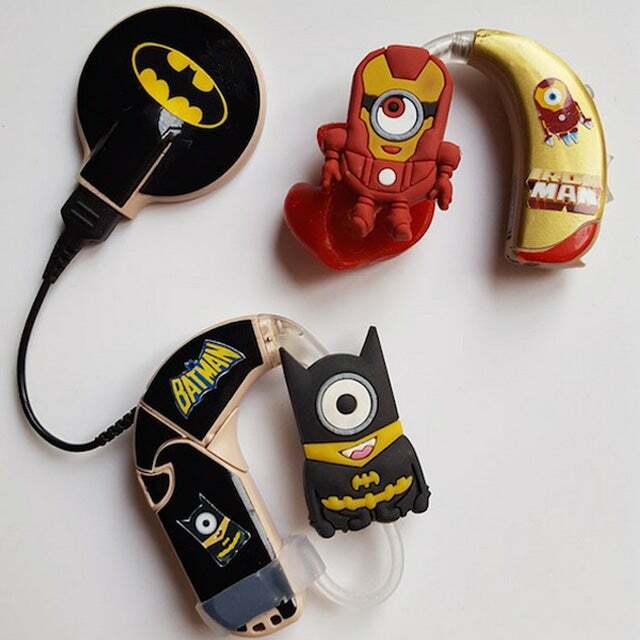 Fortunately, some awesome people (as you’ll see below) have really stepped up to create cute and cool decorations for hearing devices (mostly hearing aids and cochlear implants). In addition, their back stories are absolutely touching. So, at the very least make sure you check out their shop or say hey on Facebook. We scoured and searched and used our audiological super powers (if only those really existed) to find some awesome people making awesome decorations for hearing aids. Back Story: “When I was little and attended a school for hard of hearing and deaf children I noticed that a lot of kids tried to hide their hearing aids behind their hair. I wanted to make my hearing aids shine and be fancy and proud of my hearing aids. I started drawing pictures along with my sisters showing how I could make my hearing aids shine. My mom helped me make our designs into jewelry for my hearing aids and they were so fancy. Other kids and adults started wanting them too! Back Story: “As a parent with a beautiful, silly 4 year old daughter, who happens to be Deaf, it has been a challenge to keep track of her hearing aids. 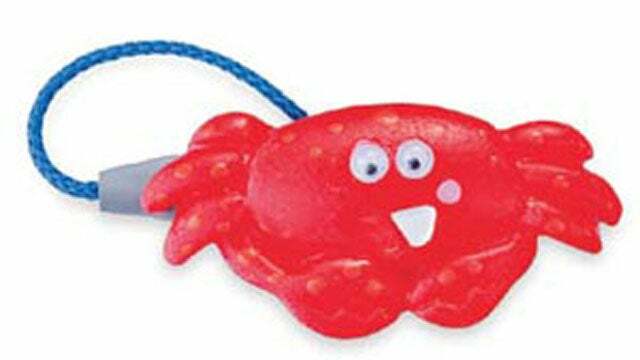 From being used as chew toys, to being washed in the shower, we have had our mishaps with them. Back Story: “At 3 months old our first child Freddie, was diagnosed as profoundly deaf in his right ear and moderately to severely deaf in his left ear caused by CMV (cytomegalovirus) during my pregnancy. Soon after diagnosis he was given his first hearing aid, a small beige coloured device with a clear mould. Not the best looking but it did the job! Then last year, at 3 years old he had a cochlear implant fitted and the device choices were mildly better, but still just simple colours. We have always been so lucky with Freddie when it comes to wearing his hearing aid and cochlear implant, they are rarely off. But as we met other families with children who had hearing aids and implants we discovered that not all children were as happy to wear their devices. Most didn’t like the way they looked boring and plain, and unfortunately a lot were embarrassed about wearing them because it made them look different. A friend of ours has a 9yr old daughter who hates being different and having to have hearing aids. I happened to have some flowery nail stickers lying around at home and gave them to her to decorate her aids and she loved them! I thought to myself that it seemed such a simple solution there must be some kind of product on the market that did the same. It was a real shame to find there was hardly anything out there that was simple to use and readily available, and this got me thinking! Back Story: In 2012 I helped create a group on Facebook to help pimp their Hearing Aids & CI’s. Through this group people started to create their own charms to wear. I started to make them for my daughter and the business started from there. In July 2013 I started the Etsy shop to help spread the word to those who are either don’t have facebook or are unable to go on Facebook. As the business has grown so has the range, from just charms, to storage pouches and safety clips. I am the original UK seller of charms. Don’t accept imitations. 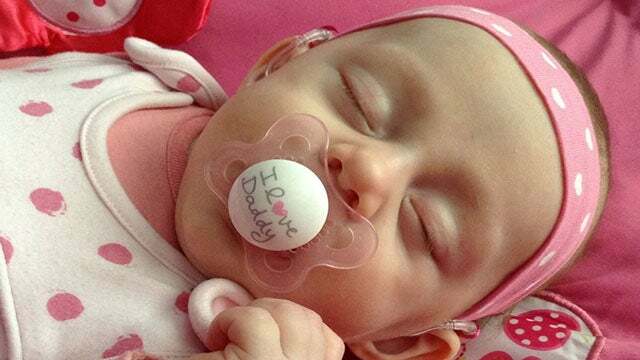 Back Story: “My daughter Lauren was diagnosed with a severe hearing loss at birth and was fitted with her first hearing aid at 6 weeks of age. 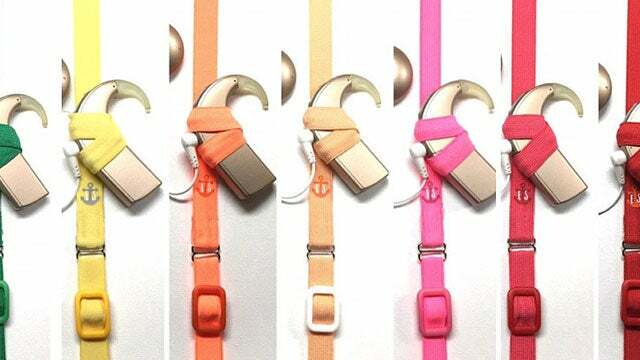 At first she kept her aids in fine until she got to about 4 months old, she then started to pull them out so I invented the Hearing Aid Headband with its special patent pending pockets that hold the aid behind the ear. These made an immediate difference. Because the headband holds the aids in place it feels more secure to her so it stops her from pulling it out as much but also as the aid is attached to the headband that when she does pull them out they are harder to lose and the risk of her getting to the battery is greatly reduced. I was then approached by other parents and teachers of the deaf to make them for them too. So I started a Facebook page and have now made over 100 headbands for children of all different ages. 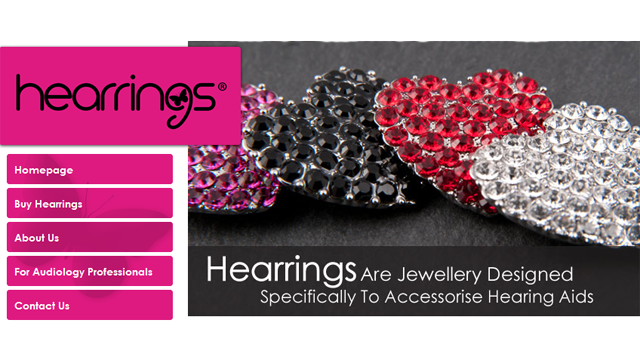 They are suitable for behind the ear hearing aids and also for cochlear implant users too. Each headband is handmade to order and tailor made for the user. So if you only have one hearing aid then I only make 1 pocket. Back Story: If you have trouble keeping your child’s hearing aids in Little Angels Wear has hats and clips that may help. They make beautiful hats and headbands to help parent with children with hearing aids and cochlear implants. The above shops are smaller shops created by individuals with hearing loss. I don’t say this to detract from the two shops below (because they look great), but they are larger shops with more options, and that’s the reason we separated them from above. Back Story: Polish manufacturer of accessories for cochlear implants and hearing aids. 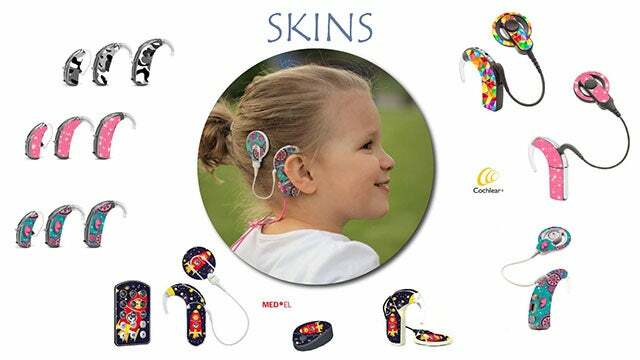 You can find different types of cochlear implants and hearing aids accessories: various types of headband, hooks, boxes, EarGear accesoriess and more. Back Story: ADCO Hearing Products is a little different than most of the above shops. Instead of focusing on just one aspect of hearing aid decorations they carry pretty much every hearing product on the market. Have you used any of these companies (or others) to decorate your hearing aids? If so, we’d love to hear about it in the comments below! I would love to be able to buy skins for my Oticon hearing aid. I’m a 63-year-old woman who is young at heart and I like to show off a bit. Thank you for this article, it’s great to see people wearing hearing aids with pride. 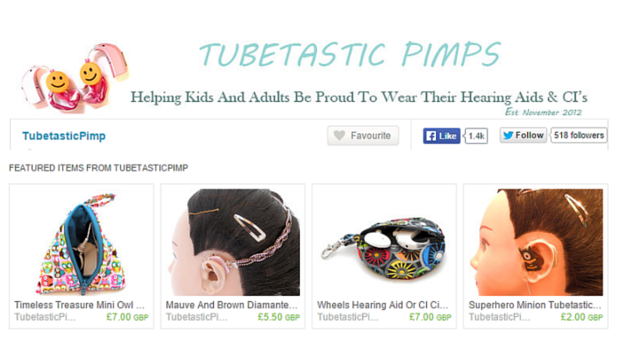 You may want to also check out BriteTubes as a source of vividly colored hearing aid tubing. 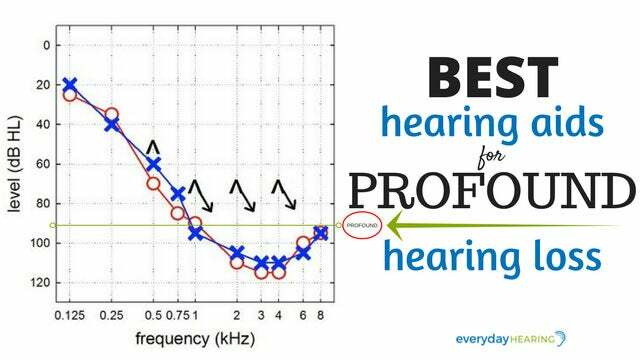 It’s so nice to see audiologists recognize that not everyone hides hearing aids. I used to, I admit. I didn’t want people at work to know I had hearing aids when I was an executive in my 30s. Now I run a biotech company and have made peace with my funny hearing genetics. I’d wear sparkling LEDs on my hearing aids now if they made them–amuses kids and helps people help me hear without making a big vocal deal about it. One look and they know. Keep up the great work, it’s needed. Thanks again, I really enjoyed this article! Barb: Where did you get hearing aids LEDs? Sounds like an exciting idea. 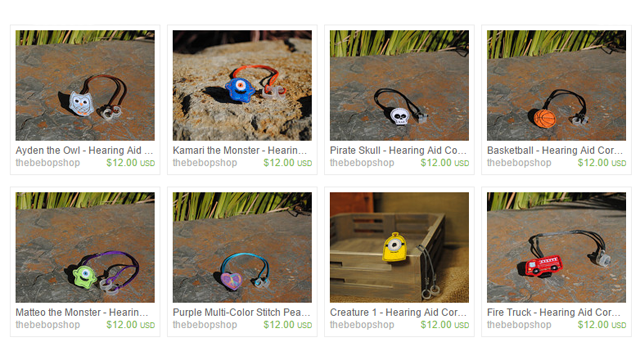 I have two Hearing Impaired children and we have ordered from The Bebop Shop several times. My kids love picking out clips to match their outfits or moods. I like having the extra security of knowing they’re attached to something! I have been very close to misplacing my hearing aids permantly. They just keep on falling off. Is there anything I can do to fasten them to the ears? has anyone come up with some good double sided stickers that will “glue” them to the ears? You need charms, beads, craft wire, cutters and toggles. Thread the charm on to wire and twist. Add beads and attach to toggle ring. Cut the wire close so it doesn’t scratch. If the aids are new you mayhear them rattling and a swishing noise. The only limit is your imagination. OK—as for holding you hair in place, this is a 5 star item. As for the many ways to wear it…again a 5 star item. As for using this to workout, if I could give it 0 stars, I would! This holds back the sweat for a little bit then suddenly gets drenched and you do feel the sweat pour down. Love the designs but the fabric is not ideal for a sweaty workout—I personally do not recommend for running, hot yoga, spinning or cross training. Great if you are gardening and need to keep hair off your face or are in a convertible car and need to keep your hair in place. They wash well and do not stretch but for me, unfortunately, they do not satisfy my needs.